40 million tracks from just £3.99 per month and you can tell it to, "Play that song that goes 'I need a one dance'." 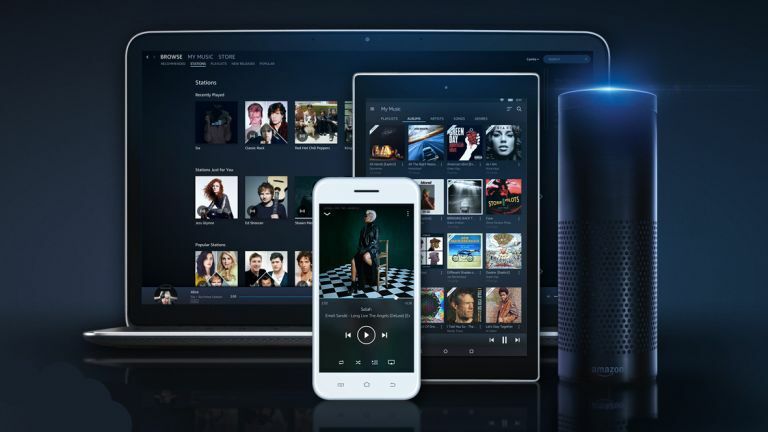 Amazon is bringing Music Unlimited to the UK, and it looks like a genuine killer app for Amazon Prime users and, most particularly, Echo users, thanks to some extremely aggressive pricing. We've had a bit of a hands on with Music Unlimited on Echo and It Is Impressive. Given the pricing, and that it's also available via some decent mobile and desktop apps, Spotify should be worried. For those with no Amazon ties, the service is £9.99 per month, which arguably means there's no reason to use it instead of Spotify. However, if you're paying the requisite 79 quid a year for Amazon Prime, you can get Music Unlimited for £7.99 pr month or, even more keenly, just a further £79 for a full year's worth of streaming. However, things get really tasty if you own an Echo or Echo Dot. To receive Amazon Prime through one such device costs just £3.99 per month. If that doesn't further drive sales of both Echos and Music Unlimited, we don't know what will. Admittedly, the deal is limited literally to that one device – there's no mobile access for you, here – but then Music Unlimited has been built primarily to turn Echo's personal assistant Alexa into a better DJ than ever. As well as asking for tracks and albums by artists, you can also ask her to play music by date of recording, genre and mood – "Happy 80s music" or, if that's not your bag, "sad indie music from the 90s", for instance. Even something like "Alexa: play David Bowie music from the 70s, before he went a bit crap." She won't understand the last bit, but what the hell. This data is taken from Amazon's huge online repository, which has been updated to include data on mood, and the year of recording. That's as opposed to the year of release, so the Beatles are nestled in the 60s rather than the 80, 90s, 00s and 10s, when their back catalogue was re-released and re-re-released. But perhaps most impressive of all, Alexa can take the role formerly filled by disinterested record shop employees: you can ask her to play half-remembered tunes, by quoting snatches of their lyrics. Amazon claims that "70 something per cent" of the tunes available have searchable lyrics. Although sadly, you can't yet hum a tune you heard last Thursday and get playback that way. The reason this all works so well is because the voice recognition on Alexa/Echo is really superb. We've been moaning that Echo has amazing promise but doesn't really do a lot. Well, now it does one more thing, and it's great. Interestingly, the existing Amazon Prime Music service will continue to run alongside Music Unlimited, with a more curated selection of 2 million tracks, a number which now includes the Beggar's Group (ie: Adele). And you will get all the new voice control bells and whistles with the older service, too. Music Unlimited is live now, with free trials available on Echo. You just have to say, "Alexa, start my Amazon Music Unlimited free trial.” Obviously.